Could Our Captain be Returning to the Franchise? 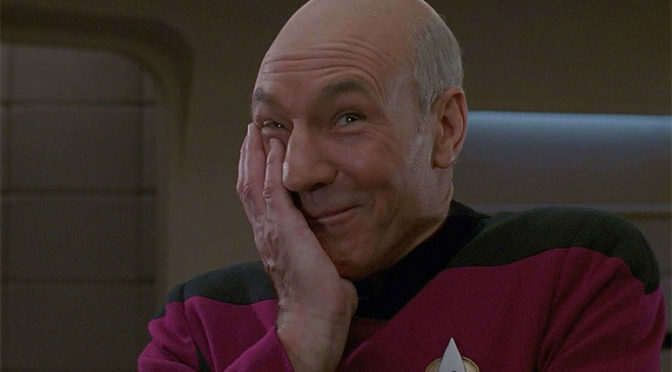 So last month, the internet went crazy with the news that Quentin Tarantino expressed interest in directing a STAR TREK. Even more so that it sounds like Paramount is on board, with J.J. Abrams heading up the writer’s room. But it gets even better Boys and Girls, cause sounds like a TNG Alum would love to come back if this happens! Watching this movie I was reminded of a conversation I had with some friends of mine, specifically what directors am I always excited for when they have a movie coming out. And I have to say, Quentin Tarantino is definitely one of them. I mean, with the exception of JACKIE BROWN (it didn’t do much for me), I’ve loved all his movies. Everything from his writing, to how he frames his stories, his movies are always a huge amount of fun to watch.